I didn’t count the hard returns, but suffice it to say this is NOT the best way to get a new page. 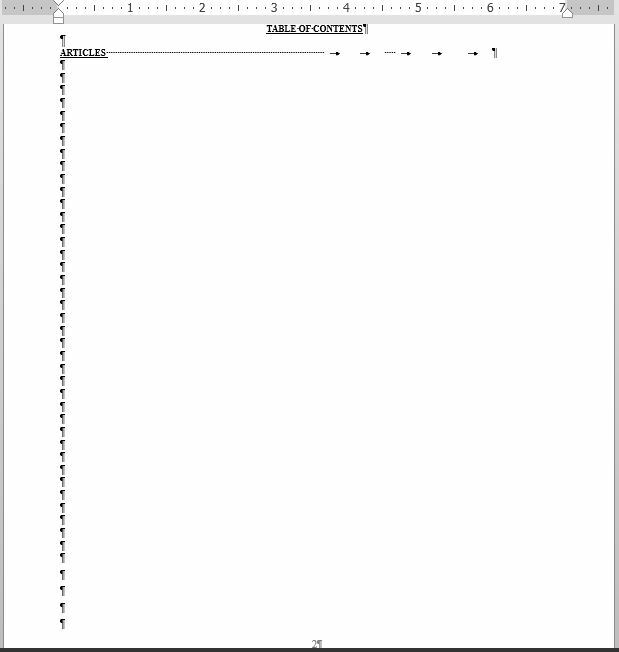 In this particular situation, as soon as the Table of Contents is generated and fills the page, ALL those hard returns will have to be deleted. In the broader scope of document editing, anytime someone presses the Enter key multiple times to get to the next page, all those extra hard returns will have to be deleted when the document is edited and pagination changes. When this method of getting to a new page is used multiple times throughout a document, editing can easily turn into a circular game of adding and deleting hard returns every time text is added or removed. Instead of pressing the Enter key over and over and over and OVER again, try pressing the keyboard shortcut “CTRL+Enter” to insert a page break at the location of your cursor. I’ll address all the unnecessary spaces and tabs after the word ARTICLES in another post.